husband. To this end, to free himself of all obstacles, he with fair flattering entreaties desires his wifr 10 repose herself here,“that is, at Cutnnor in Berkshire, where this tragical affair was executed, ” at his servant Anthony Forster’s house, who then lived in the manor house of this place; and also prescribed to sir Richard Varney, a promoter to this design, at his coming hither, that he should first attempt to poison her, and, if that did not take effect, then by any other way whatsoever to dispatch her.“The scheme of poisoning not succeeding, they resolved to destroy her by violence; and, as Aubrey relates, they effected it thus: ” Sir Richard Varney, who. by the earl’s order, remained with her alone on the day of her dea’h, aud Tors’er, who had that day forcibly sent away all her servantsfrom her to Abingdon fair, about three miles distance from this place; these two persons, first stifling her, or else strangling her, afterwards flung her down a pair of stairs and broke her neck, using much violence upon her: yet caused it to be reported, that she tell down of herself, believing the world would have thought it a mischance, and not have suspected the villany. As soon as she was murdered they made haste to bury her, before the coroner had given in his in­ quest, which the earl himself condemned, as not done advisedly; and her father, sir John Rebsart, hearing, came with all speed hither, caused her corpse to be taken up, the coroner to sit upon her, and further inquiry to be made concerning this business to the full. But it was generally thought, that the earl stopped his mouth; who, to shew the great love he bore to her while alive, and what a grief the loss of so virtuous a lady was to his tender heart, caused her body to be buried in St. Mary’s church in Oxford, with great pomp and solemnity. 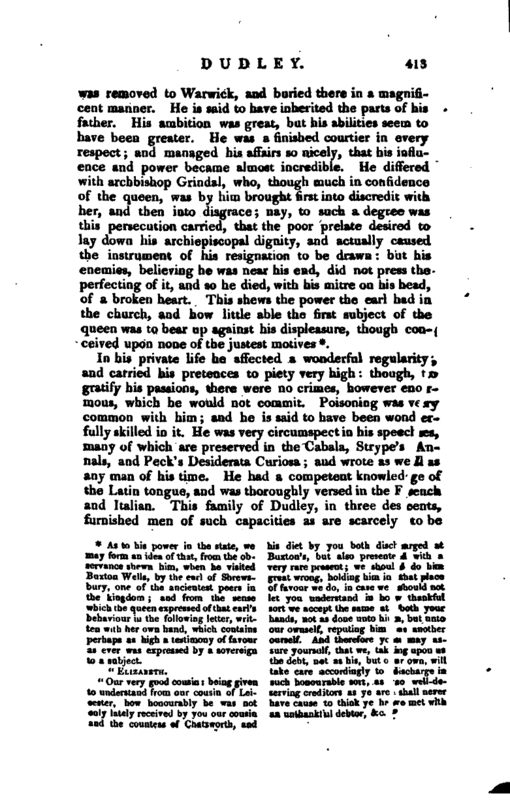 It is also remarkable,“says Aubrey, ” that Dr. BabingtoH, the earl’s chaplain, preaching the funeral sermon, tripped once or twice in his speech, by recommending to their memories that virtuous lady so pitifully murdered, instead of saying, so pitifully slain.“Antiquities of Berkshire, vol. i. p. 149. 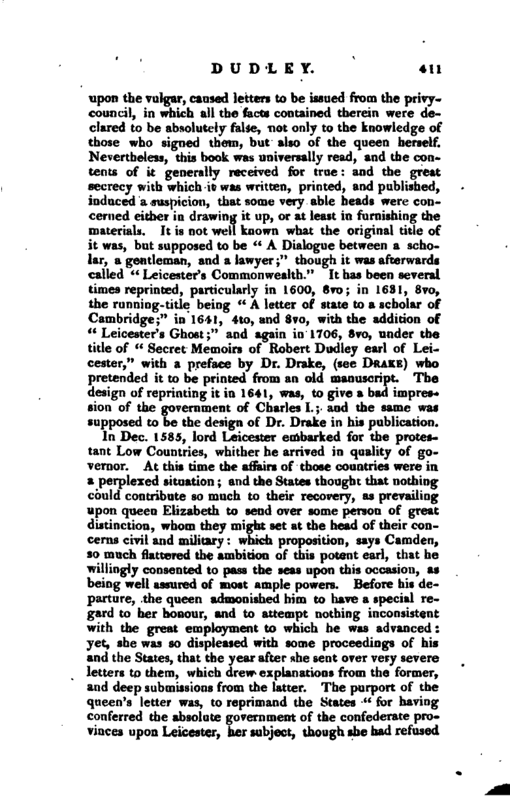 This narrative, hewever, appears doubtful, because it is in fact almost closely copied from ”Leicester’s Commonwealth," a work whioh, with some truth, contains also much misR-prtsen’ation. Ye! this noblernau’s moral chaiacter, we fear, will not bear a very strict examination. 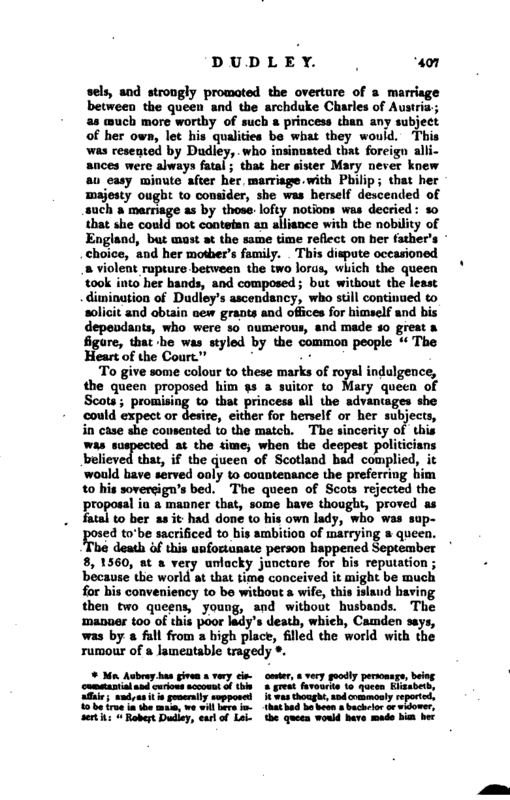 Concerning queen Elizabeth’s inclination to marry him, see a letter in lord Hardwioke’s State-papers, vol. I. p f 1631—69. | In Sept. 1564, the queen created him baron of Denbigh,­and, the day after, earl of Leicester, with great pomp and ceremony; and, before the close of the year, he was made chancellor of Oxford, as he had been some time before high-steward of Cambridge. His great influence in the court of England was not only known at home, but abroad, which induced the French king, Charles IX. to send him the order of St. Michael, then the most honourable in France; and he was installed with great solemnity in 1565. About 1572 it is supposed that the earl married Douglas, baroness dowager of Sheffield: which, however, was managed with such privacy, that it did not come to the queen’s ears, though a great deal of secret history was published, even in those days, concerning the adventures of this unfortunate lady, whom, though the earl had actually married her, and there were legal proofs of it, yet he never would own as his wife. 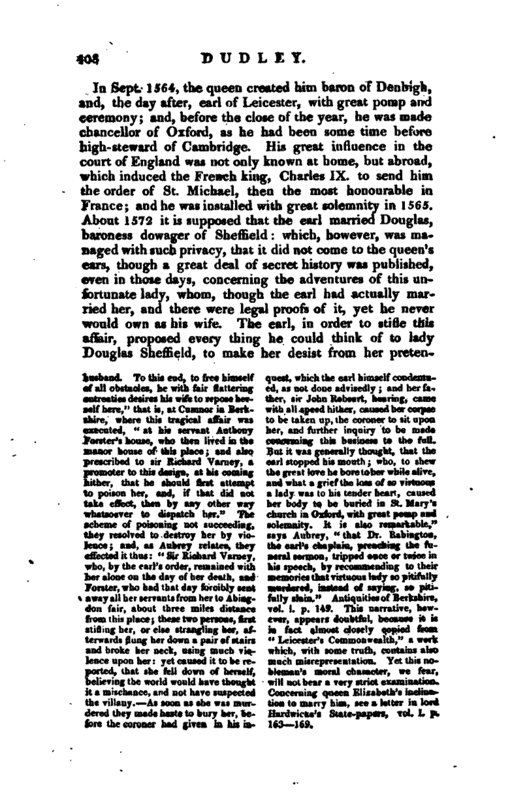 The earl, in order to stifle this affair, proposed every thing he could think of to lady Douglas Sheffield, to make her desist from her | pretensions but, finding her obstinate, and resolved not to comply with his proposals, he attempted to take her off by poison “For it is certain,” says Dugdale, “that she had some ill potions given her, so that, with the loss of her hair and nails, she hardly escaped death.” It is, however, beyond all doubt, that the earl had by her a son (sir Robert Dudley, of whom we shall speak hereafter, and to whom, by the name of his Base Son, he left the bulk of his fortune), and also a daughter. In July 1575, as the queen was upon her progress, she made the earl a visit at his castle of Kenilworth in Warwickshire. This manor and castle had formerly belonged to the crown; but lord Leicester having obtained it from the queen, spared no expence in enlarging and adorning it: and Dugdale says, that he laid out no less than 60,000l. upon it. 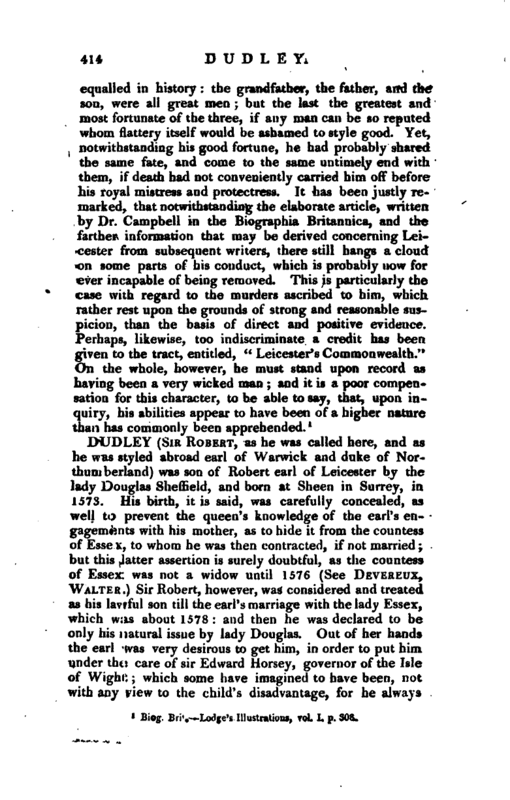 Here, due preparation being made, he entertained the queen and her court for seventeen days with a magnificence, of which, being characteristic of the times, the following account from Dugdale may be not unamusing. 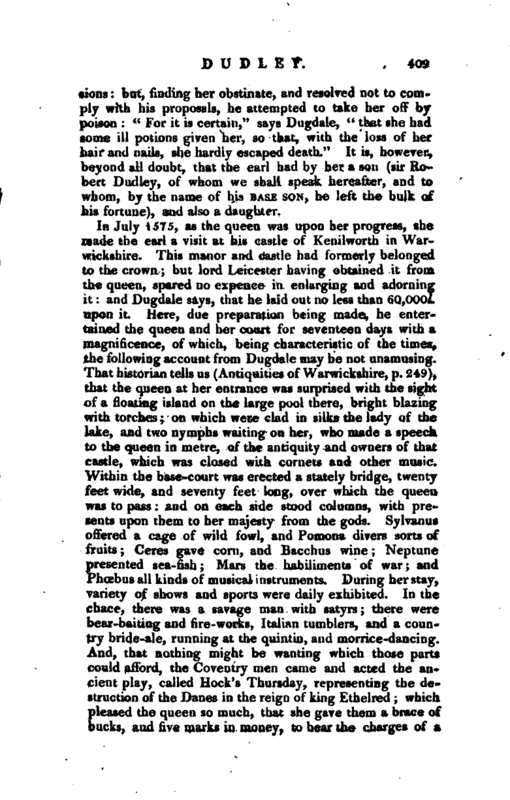 That historian tells us (Antiquities of Warwickshire, p. 249), that the queen at her entrance was surprised with the sight of a floating island on the large pool there, bright blazing with torches; on which were clad in silks the lady of the lake, and two nymphs waiting on her, who made a speech to the queen in metre, of the antiquity and owners of that castle, which was closed with cornets and other music. Within the base-court was erected a stately bridge, twenty feet wide, and seventy feet long, over which the queen was to pass: and on each side stood columns, with presents upon them to her majesty from the gods. Sylvanus offered a cage of wild fowl, and Pomona divers sorts of fruits Ceres gave corn, and Bacchus wine Neptune presented sea- fish Mars the hahiliments of war; and Phcebus all kinds of musical instruments. During her stay, variety of shows and sports were daily exhibited. In the chace, there was a savage man with satyrs; there were bear-baiting and fire-works, Italian tumblers, and a country bride-ale, running at the quintin, and morrice-dancing. And, that nothing might be wanting which those parts could afford, the Coventry men came and acted the ancient play, called Hock’s Thursday, representing the destruction of the Danes in the reign of king Ethelred; which pleased the queen so much, that she gave them a brace of bucks, and five marks in money, to bear the charges of a | feast. There were, besides, on the pool, a triton riding on a mermaid eighteen feet long, as also Anon on a dolphin, with excellent music. The expences and costs of these entertainments may be guessed at by the quantity of beer then drunk, which amounted to 320 hogsheads of the ordinary sort: and, for the greater honour and grace thereof, sir Thomas Cecil, son to the treasurer Burleigh, and three more gentlemen, were then knighted; and, the next ensuing year, the earl obtained a grant of the queen fora weekly market at Kenihvorth, with a fair yearly on Midsummer-day. So far Dugdale. There is also in. 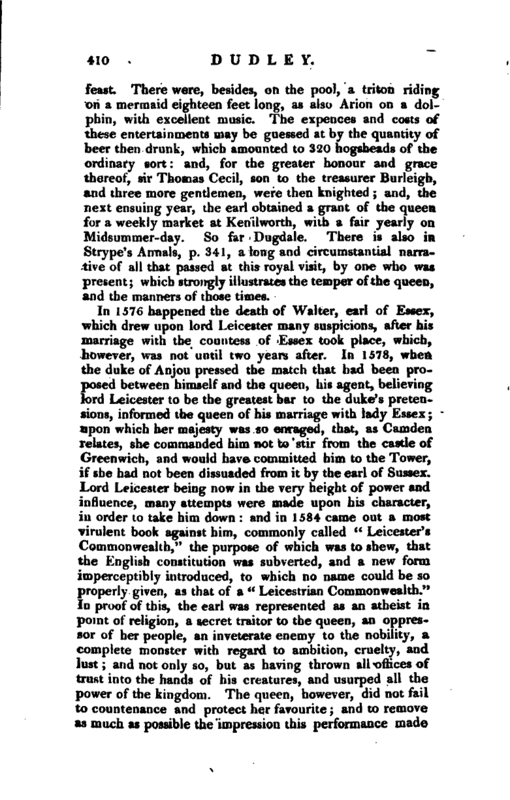 Strype’s Annals, p. 341, a long and circumstantial narrative of all that passed at this royal visit, by one who was present; which strongly illustrates the temper of the queen, and the manners of those times. In 1576 happened the death of Walter, earl of Essex, which drew upon lord Leicester many suspicions, after his marriage with the countess of Essex took place, which, however, was not until two years after. In 1578, when the duke of Anjou pressed the match that had been proposed between himself and the queen, his agent, believing lord Leicester to be the greatest bar to the duke’s pretensions, informed the queen of his marriage with lady Essex; upon which her majesty was so enraged, that, as Camden relates, she commanded him not to stir from the castle of Greenwich, and would have committed him to the Tower, if she had not been dissuaded from it by the earl of Sussex. Lord Leicester being now in the very height of power and influence, many attempts were made upon his character, in order to take him down: and in 1584 came out a most virulent book against him, commonly called “Leicester’s Commonwealth,” the purpose of which was to shew, that the English constitution was subverted, and a new form imperceptibly introduced, to which no name could be so properly given, as that of a “Leicestrian Commonwealth.” In proof of this, the earl was represented as an atheist in point of religion, a secret traitor to the queen, an oppressor of her people 1 an inveterate enemy to the nobility, a complete monster with regard to ambition, cruelty, and Just; and not only so, but as having thrown all offices of trust into the hands of his creatures, and usurped all the power of the kingdom. The queen, however, did not fail to countenance and protect her favourite; and to remove as much as possible the impression this performance made | upon the vulgar, caused letters to be issued from the privycouncil, in which all the facts contained therein were declared to he absolutely false, not only to the knowledge of those who signed them, but also of the queen herself. Nevertheless, this book was universally read, and the contents of it generally received for true: and the great secrecy with which it was written, printed, and published, induced a suspicion, that some very able heads were concerned either in drawing it up, or at least in furnishing the materials. It is not well known what the original title of it was, but supposed to be “A Dialogue between a scholar, a gentleman, and a lawyer;” though it was afterwards called “Leicester’s Commonwealth.” It has been several times reprinted, particularly in 1600, 8vo; in 1631, 8vo, the running-title being “A letter of state to a scholar of Cambridge;” in 1641, 4to, and 8vo, with the addition of “Leicester’s Ghost;” and again in 1706, 8vo, under the title of “Secret Memoirs of Robert Dudley earl of Leicester,” with a preface by Dr. Drake, (see Drake) who pretended it to be printed from an old manuscript. The design of reprinting it in 1641, was, to give a bad impression of the government of Charles I.; and the same was supposed to be the design of Dr. Drake in his publication. In Dec. 1585, lord Leicester embarked for the protestant Low Countries, whither he arrived in quality of governor. At this time the affairs of those countries were in a perplexed situation; and the States thought that nothing could contribute so much to their recovery, as prevailing upon queen Elizabeth to send over some person of great distinction, whom they might set at the head of their concerns civil and military: which proposition, says Camden, so much flattered the ambition of this potent earl, that he willingly consented to pass the seas upon this occasion, as being well assured of most ample powers. Before his departure, the queen admonished him to have a special regard to her honour, and to attempt nothing inconsistent with the great employment to which he was advanced: yet, she was so displeased with some proceedings of his and the States, that the year after she sent over very severe letters to them, which drew explanations from the former, and deep submissions from the latter. 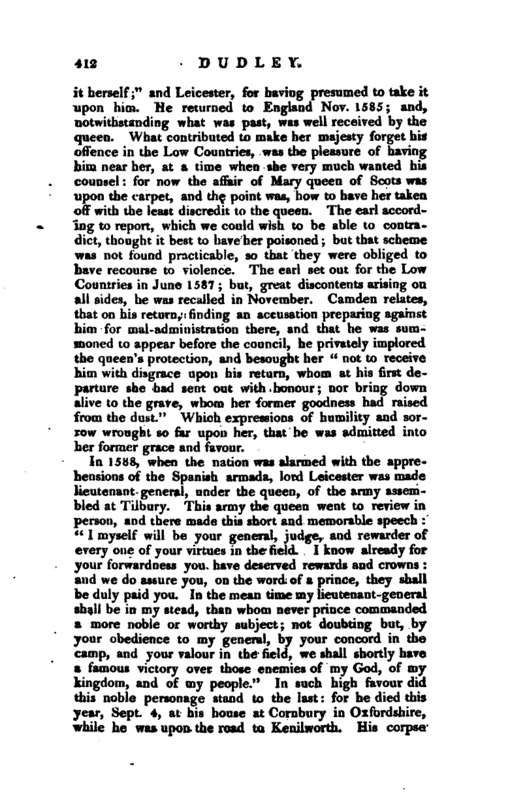 The purport of the queen’s letter was, to reprimand the States “for having conferred the absolute government of the confederate provinces upon Leicester, her subject, though she had refused | it herself;” and Leicester, for having presumed to take it upon him. He returned to England Nov. 1585; and, notwithstanding what was past, was well received by the queen. What contributed to make her majesty forget his offence in the Low Countries, was the pleasure of having him near her, at a time when she very much wanted his counsel: for now the affair of Mary queen of Scots was upon the carpet, and the point was, how to have her taken off with the least discredit to the queen. The earl according to report, which we could wish to be able to contradict, thought it best to have her poisoned; but that scheme was not found practicable, so that they were obliged to have recourse to violence. The earl set out for the Low Countries in June 1587; but, great discontents arising on all sides, he was recalled in November. 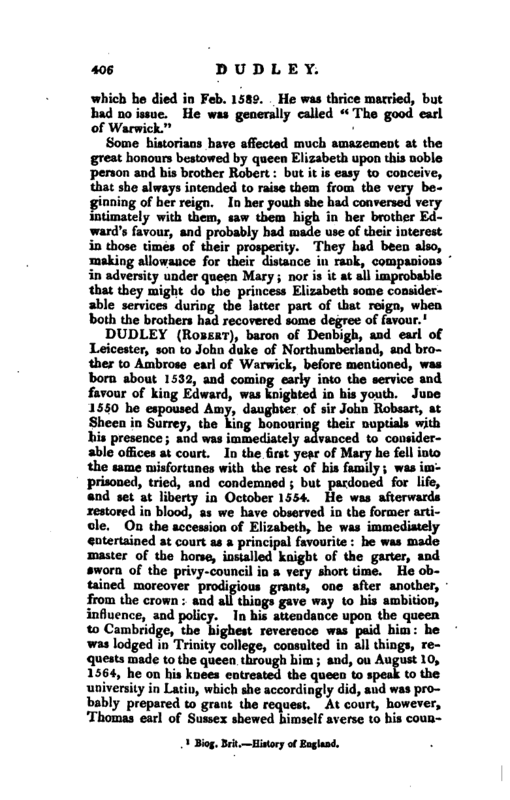 Camden relates, that on his return, finding an accusation preparing against him for mal-administration there, and that he w^as summoned to appear before the council, he privately implored the queen’s protection, and besought her “not to receive him with disgrace upon his return, whom at his first departure she had sent out with honour; nor bring down alive to the grave, whom her former goodness had raised from the dust.” Which expressions of humility and sorrow wrought so far upon her, that he was admitted into her former grace and favour. As to his power in the state, we may form an idea of that, from the observance shewn him, when he visited Buxton Wells, by the earl of Shrewsbury, one of the ancientest peers in the kingdom; and from the sense which the queen expressed of that earl’s behaviour in the following letter, written with her own hand, which contains perhaps as high a testimony of favour as ever was expressed by a sovereign to a subject. Biog. Brit. Lodge’s Illustrations, vol. I. p. 308.